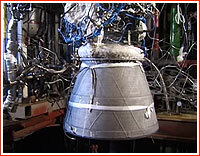 In October 2017, after a more than year-long break, Ukraine's KB Yuzhnoe resumed testing of the RD-861K engine developed for the upper stage of prospective space launch vehicles. 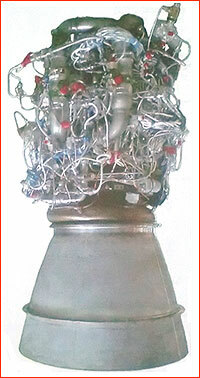 The original version of the RD-861K engine with a carbon nozzle. 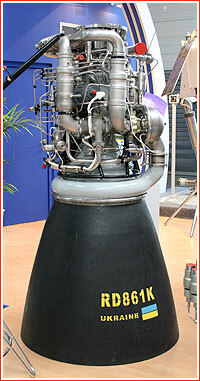 The RD-861K engine was originally intended for the ill-fated Tsyklon-4 project developed and funded jointly by Ukraine and Brazil. After the collapse of the venture around 2015, the RD-861K was re-purposed for the commercial Tsyklon-4M rocket, which KB Yuzhnoe hopes to develop in Ukraine and launch from a yet-to-be built spaceport in Canada. There are also reports that China has eyed the RD-861K for potential applications on one of its own future space launchers. According to industry sources, three series of multiple tests have been successfully conducted at a static facility in the city of Dnipro, Ukraine, on October 17, 20 and 24, 2017. 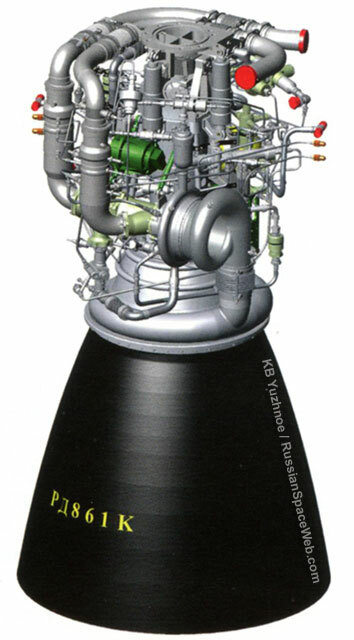 Each test cycle, known as Delivery and Tune-up Test, ZDI, included multiple firings of the engine, simulating its performance in real flight of the defunct Tsyklon-4 rocket. Because RD-861K is intended for the upper stage tasked to perform orbital maneuvers, it should be able to fire up to five times in each mission. Besides their engineering goals, these tests probably aimed to demonstrate the validity of the RD-861K program to investors in the Tsyklon-4M project and potential foreign buyers of the engine itself. 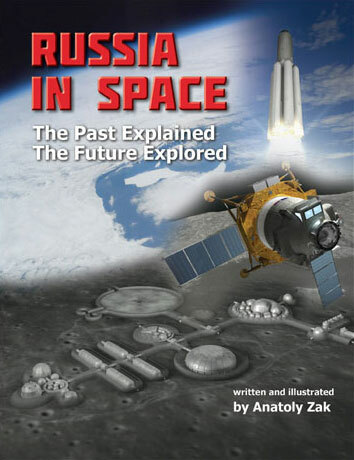 The resumption of the tests was also intended to boost the morale inside the beleaguered Ukrainian rocket industry, which had faced many problems after the breakdown of its ties to Russia in the wake of the annexation of Crimea in 2014. In particular, the Ukrainian propulsion systems depended on supplies of Russian structural materials and hardware. Experts familiar with the matter say that the RD-861K engine is almost ready for operational use, but its development and serial manufacturing still faces serious challenges due to lack of resources, personnel and propellant components. The engine burns hydrazine and nitrogen tetroxide which are not currently produced in Ukraine and have to be imported from China. There are also problems with the production of new components for the engine, which forced engineers to recycle parts from older units and caused several delays in the latest tests. The development of the RD-861K engine started in 2003 and it began live firings in 2007. (809) A total of 17 engines are known to have been tested at a static stand in Dnipro. Around two thirds of these engines are reported to be refurbished units providing enough hardware for around eight fully assembled engines. Before the latest series of tests in October 2017, RD-861K had made 10 firings in April 2016. Another ZDI test of the RD-861K engine was completed on Nov. 21, 2017, despite a number of technical problems mostly associated with ground equipment. Again, the engine completed three burns lasting around 500 seconds and also featuring the operation of the gimbal mechanism designed to steer the engine in flight. The gimbal mechanism had been tested before and it was originally planned to be operational in the October 2017 firings, but an error during checks damaged an actuator within the mechanism. As of end of November 2017, the final ZDI test for the RD-861K engine was planned before the formal conclusion of the program. That firing will be conducted with another copy of the engine, which will be assembled from available spare parts and recycled components. Upon the completion of the test series for the defunct Tsyklon-4 program, KB Yuzhnoe hoped to use RD-861K for new firings, this time, to benefit the prospective Tsyklon-4M rocket. Engineers made plans to test-fire a fully assembled rocket stage, which had already been built as the third stage for Tsyklon-4, but now expected to serve as the second stage on Tsyklon-4M. One industry source told RussianSpaceWeb.com that KB Yuzhnoe had been able to line up domestic suppliers of the structural materials necessary for the RD-861K program. However according to another expert, the production of the turbine for the RD-861K still depended on the EP742 heat-resistant alloy that KB Yuzhnoe had procured from the TsNIIMV material science institute based in Korolev, Russia. Each turbine in the RD-861K engine is certified to operate in up to a dozen of live firings before being replaced. Theorethically, a similar material for the turbine could be acquired elsewhere, but it would need to go through its own tests before being certified for use on the engine, an expert familiar with the matter said.